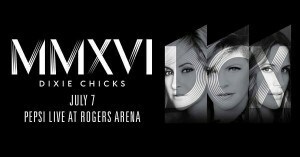 Innovators, renegades, villains, mothers, influencers and music superstars, Dixie Chicks, announced today a return to touring with their upcoming DCX MMXVI World Tour. The multiple Grammy Award®–winning and multi-platinum selling band will kick off their highly anticipated North American tour, produced by Live Nation, on June 1, 2016 at the Riverbend Music Center in Cincinnati, Ohio. DCX MMXVI World Tour will visit over 40 cities throughout the U.S. and Canada with dates lined up in New York City, Los Angeles, Toronto, Chicago, Vancouver, Washington DC, San Francisco, Philadelphia, Boston and more. A full list of dates is below. The North American leg of the DCX MMXVI World Tour immediately follows the group’s previously announced European tour shows.